The beginning of last week was in the 80's when I set up my outdoor tea party, but a few days later, the temperatures dropped to the 20's! Brrrrr!!! However, today is going to be in the 70's...crazy weather we have here in Texas! I always look forward to using this Royal Albert December teacup that a dear friend gave to me from her late Mother's collection. It looks pretty on my Big Star quilt topper that I made years ago. A very thoughtful, and sweet blogging friend surprised me with this Advent Tea Calendar!!! I have never had one, and I am so delighted to open a window each day for a new tea to try. She also sent me the stacked teacup Christmas towel. Isn't it pretty? I have an area between my kitchen and dining room, which is a Butler's pantry, that I use for my electric tea kettle and tea supplies. I'm displaying the Advent Tea Calendar there. Today's flavored tea, for December 11th, is Afternoon Tea. Thank you so much, Mary! This recipe comes from one of the first cookbooks that I purchased when I started teaching Home Economics, which is the Farm Journal Christmas Cookbook. I still refer to that cookbook all these years later! This recipe doesn't have any butter or oil in it, so don't let that fool you, as the date logs are incredibly moist. Stir in the dates, nuts and eggs that have been beaten. Pour into a greased 9" square pan. Bake in a 325 degree oven for 35-40 minutes. Roll the logs a bit and then roll or shake in powdered sugar. Cissy and I made Peppermint Bark by finding a recipe on the internet. It was a fun project to do after school. What a sweet gift! Cissy is a natural! She makes me smile. I have the ingredients...I could try these! These sound delicious, Kitty. How nice that they don't have oil or butter! Goodness knows we get enough of those ingredients otherwise. I'd love to try these. At the risk of sounding silly I have to ask, do you use the dates that have sugar on them? How lovely, an Advent Calendar with an assortment of teas. I too think your Cissy is a natural! 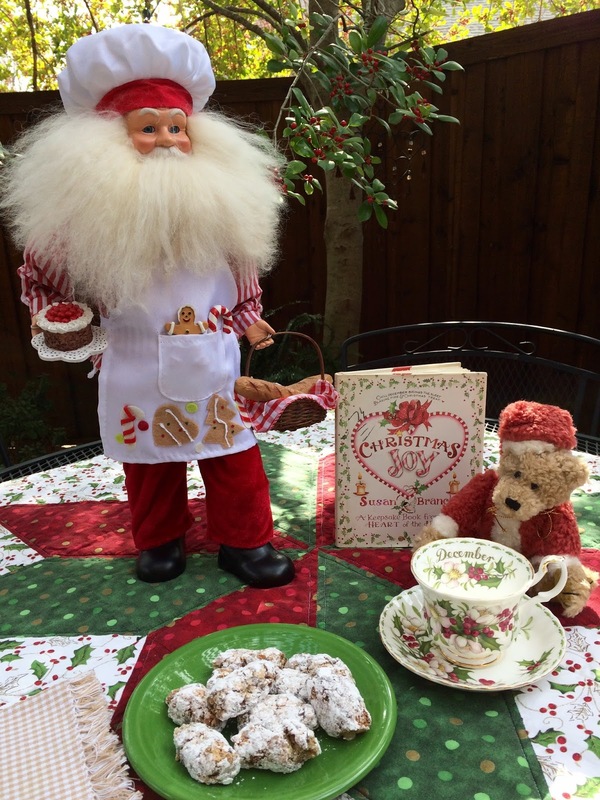 Kitty, your Christmas tea party is just delightful. The recipe for date logs looks like something my family will enjoy. Thanks for sharing. Oh that tea cup is just gorgeous! What a perfect cup for Christmas. I haven't heard of date logs. 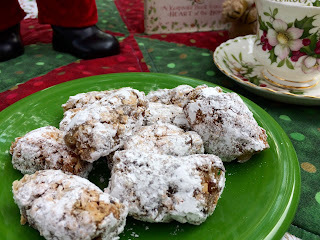 My aunt used to make date bars and they were one of the favorites and shipped so well! Can't believe the drop in temperature! Have a wonderful December! I love dates and anything baked with them! These look wonderful -- yes, 20's, THAT's cold! My mom has a date nut pudding recipe I often make at Christmas too. Hope it's warming up for you a little -- not HERE haha! Brrrrrr! Cissy is a sweetheart! We love dates here and this sounds like a great recipe. Thanks for sharing. Your Christmas tea cup is beautiful! Hello Kitty, oh I love the cute Santa, the teacup and the the advent calander and to be gifted by your friend. Those date logs look so good and pretty easy to make. I know you and Cissy have a lot of fun in the kitchen together. Thanks for sharing at C&C with J&J. Enjoy the week. Everything here is perfect: the gorgeous teacup,your cute Santa and the delicious date logs!Your gift is very pretty and Cissy is adorable as ever!Xoxo! I heard that some parts of Texas got snow last week?!? 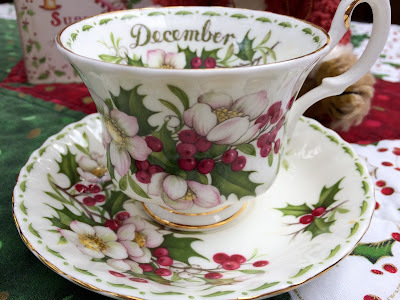 I'm loving the RA December teacup and your Tea Advent calendar. It looks like it can be reused again? The stacked teacup towel is also super cute--just like your granddaughter! How great are blogging friends, Kitty?! So great, and I am so grateful for so many. Perfect gifts for you & Cissy. 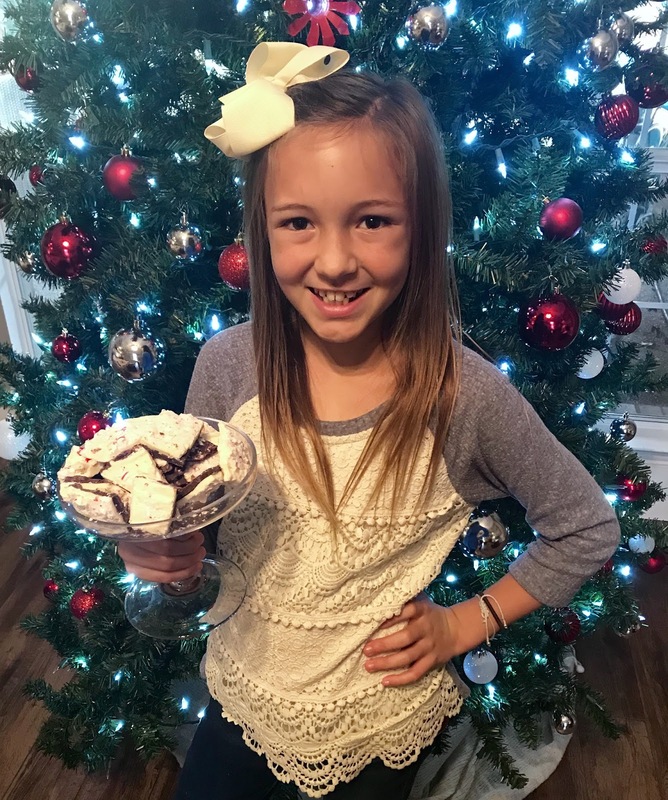 Peppermint bark is a holiday staple in our house, and Cissy sure looks like the boss holding that plate. AS crazy as the weather is all around the country, I'm just happy that the days start getting longer in 10 days! Look at that darling advent calender! I love it and such a great idea. Your dear friend certainly blessed your heart and knows you well. What a delight it must be for you and your dear granddaughter to play in the kitchen together. Love shared for sure. Hi Kitty, Cissy is a cutie. Love peppermint bark. Your tea cup is very pretty. I also love dates. Very different weather here...cold, dank, foggy and bad air...not able to go outside and enjoy it! It looks so crisp and clean there! The setting is perfect! I love the Decenber teacup and have the book as well...a joy! The recipe looks delicious, and obviously the elves approve! Thanks for linking to Tuesday Cuppa Tea! Dear Kitty: I love the looks of these dates. When I was a little girl I only had them a few times and I remember dreaming "when I grow up I will buy dates"! What a sweet post and looks plenty warm at your tea time! Thanks so much for faithfully sharing and linking. Well, I did not know that you are a former Home Ec. teacher...but it all makes perfect sense! 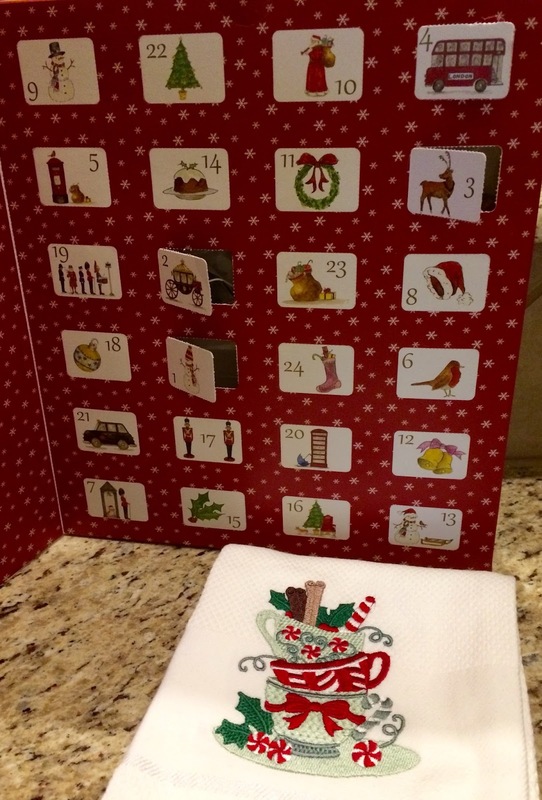 The teacup Advent calendar is so sweet and so is that lovely towel. I used to make date-nut loaves in coffee cans every year at Christmas...MANY years ago and I bet those date logs of yours are so good! Did you get much snow where you are in Texas? Looking and sound wonderful. Loving that Santa. Love your teacup and I love date logs. They are so delicious at Christmas time. Thanks for sharing. hi Kitty, first of all I laughed out loud when I saw your cute Santa chef!! So adorable! And the tea advent calendar is just the cutest, and so perfect for you! The date logs sound good, but ask Cissy to save me some of her peppermint bark! Kitty, love your Big Star quilt topper! And I so appreciate how you specified what kind of dates to use in the recipe - the chopped dates you buy have an entirely different texture than dates you chop yourself. I have a friend who would love those cookies. I love the Advent calendar, perfect for you. And the Dec. Tea cup. 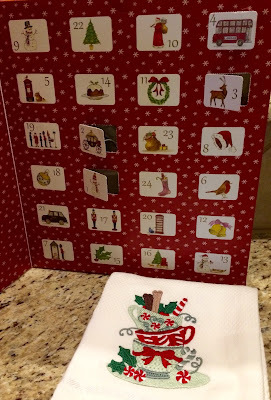 The Advent Tea Calendar is such a nifty idea and I love that tea towel with the stacked cups. I have many of the Farm Journal cookbooks -- they were some of the first ones that I owned, other than Betty Crocker -- and I love them. And Cissy -- your little chef is adorable, as always! I know what you mean about the drop in temperature we were sure looking for the fire to get warm. Your teacup is just beautiful and so special along with your Date Logs. My Mother use to make a Christmas Date Dessert very much like your logs which look delicious. Hope you have a fantastic week and thanks so much for sharing with us at Full Plate Thursday!